If the production, transporta- tion and use of LNG and LPG are related to your business in any way, you should be in Ham- burg, West Germany from Octo- ber 20 to 23. At that time the 8th International LNG/LPG Con- ference and Exhibition will be in progress. These conferences are held every two years, which al- lows time for many advances to be made in technology since the last conference. In 1979 the Con- ference and Exhibition were held in Houston, Texas, and more than 1,200 managers, engineers and technicians participated. The at- tendance this year is expected to surpass that figure. In addition to the very com- prehensive Conference program, the Gastech meeting includes, as always, a major Exhibition of liq- uefied gas technology equipment and services. More than 150 ex- hibitors will be displaying their products. The Exhibition will be the largest of its kind anywhere in the world this year. 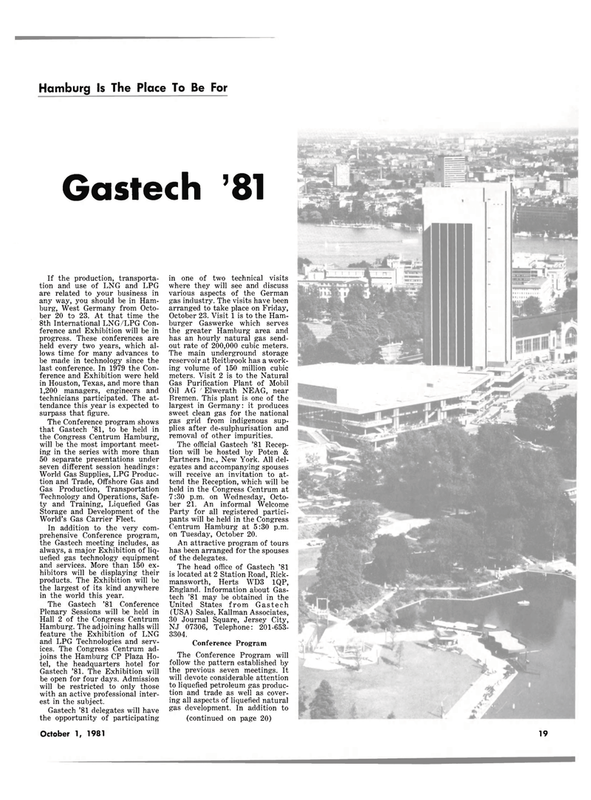 Gastech '81. The Exhibition will be open for four days. Admission will be restricted to only those with an active professional inter- est in the subject. October 23. Visit 1 is to the Ham- burger Gaswerke which serves the greater Hamburg area and has an hourly natural gas send- out rate of 200,000 cubic meters. Bremen. This plant is one of the largest in Germany: it produces sweet clean gas for the national gas grid from indigenous sup- plies after de-sulphurisation and removal of other impurities. Centrum Hamburg at 5:30 p.m. on Tuesday, October 20. An attractive program of tours has been arranged for the spouses of the delegates. NJ 07306, Telephone: 201-653- 3304.